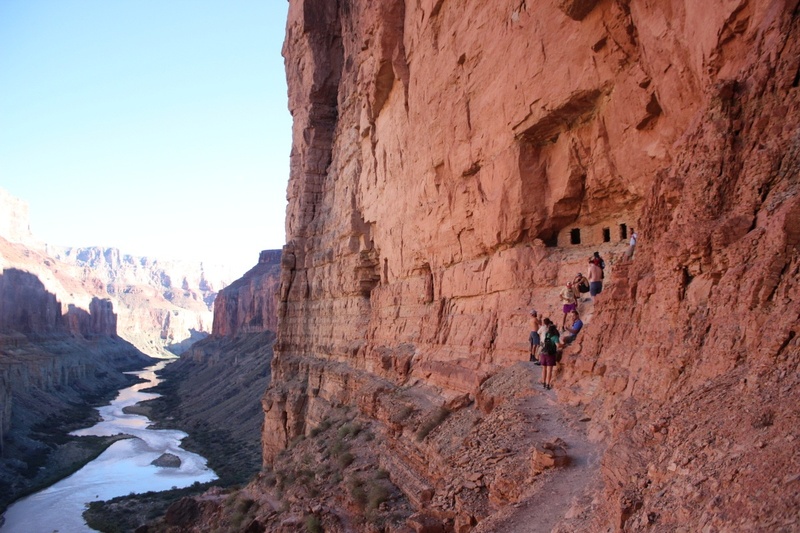 A classic Grand Canyon view from the Nankoweap Granaries, Mile 53, Photo by Jane Koopman. We were a crew of sixteen, a mixed bag of friends and family. 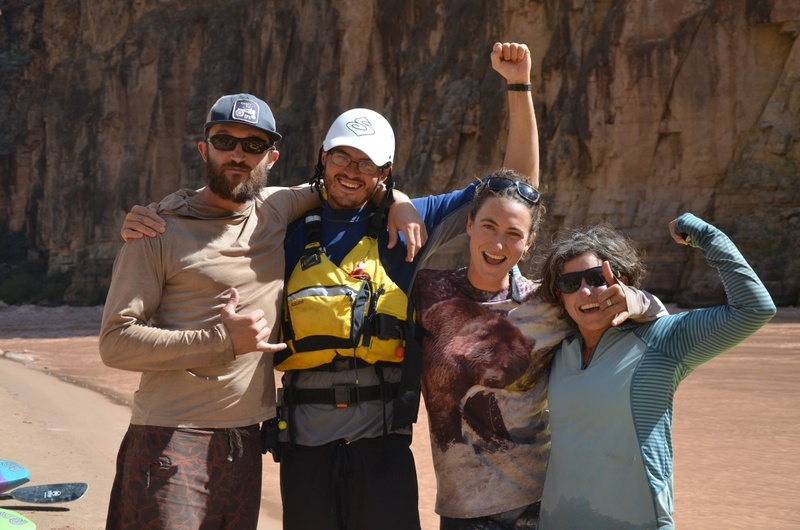 From the NOLS instructor community we had Jane, Ana, Jonny, and Guy. Here they are: Jane Koopman—river warrior, trip leader, and architect in chief of the journey; Ana Carolina Didyk Souza—Brazilian river ninja, psyched to be at the oars in the West; Jonny Hepburn—mountain instructor and sea kayaker, sharpening the skills in big water; Guy Genge—globe trotting raft guide, focussed and skilled. Team NOLS after a successful run of Lava Falls, River Mile 180. Photo by Catherine Hamley. We received support from NOLS to make the trip a reality. And we are very grateful. Five sixteen-foot rafts, shuttles to the river, a menu that would make your mouth water, and travel to and from Flagstaff don’t come for free. 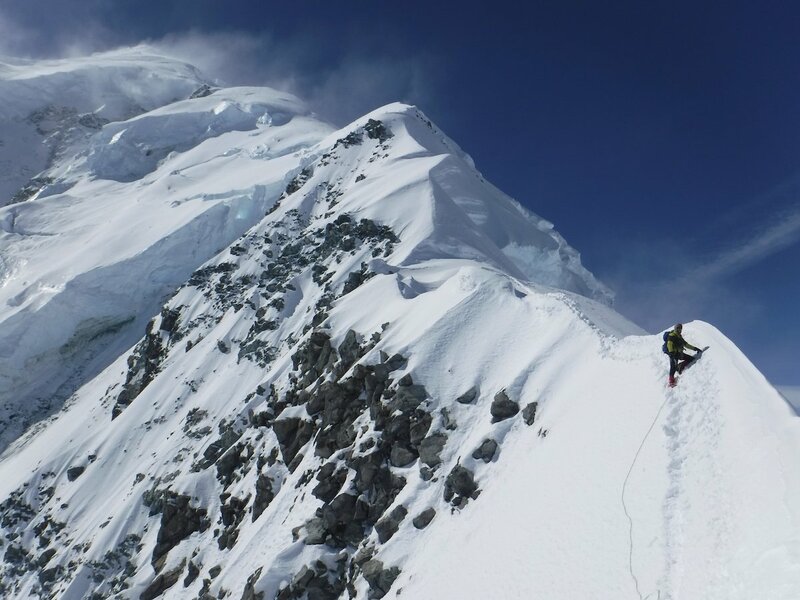 NOLS’ support brought the project into reach. After twenty months of planning, the river beckoned. Jane’s cousin had the permit, and so Jane found herself at the centre of the trip’s web—six of her family members were along on the journey (four of them are NOLS alumni! 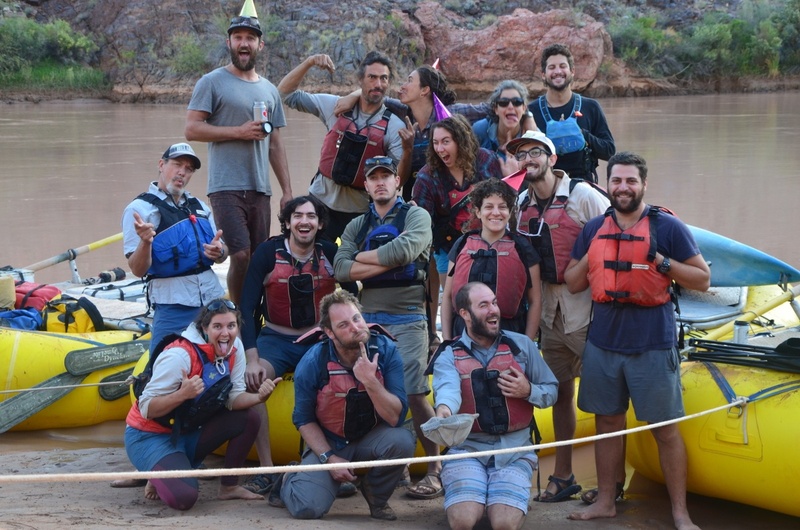 ), as well as a gaggle of friends that she had pieced together: a raft guide of ten years who brought a complete set of formal Moroccan dinnerware; boating friends from college; a Dutch teacher from Mexico City whose luxury item was an inflatable sausage; and a cousin whose first language is American Sign Language. From people who lived on the river to those who were just beginning to visit, we had the full spectrum of folk. Our motley crew—happy and birthday celebrating yet sad to be departing on our last morning in the Big Ditch at mile 221 camp. Photo by Catherine Hamley. It is no easy task to get sixteen folk on the same page, day in and day out. Balancing responsibility and recreation was the name of the game—the challenge and the reward. 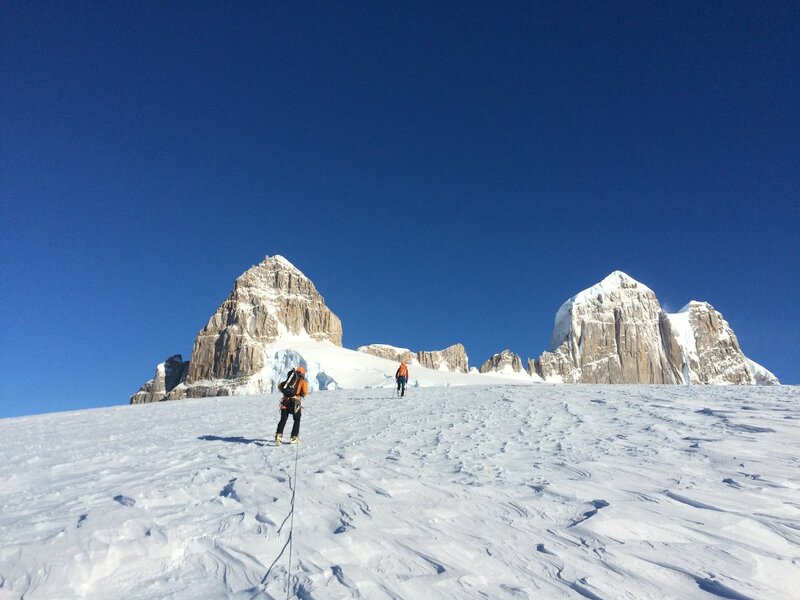 While it can be easy to be clear about who is in charge on a NOLS course, the world of friends and family is more nuanced and occasionally more complex. As we surfed this wave of interpersonal dynamic we drew on all those ideas about how we communicate and what roles we lead in. We learned lessons about leadership in the context of friendship, and this has helped us to mature—we reflect on the complexity of our students’ experience and recognize that it ain’t always clean and easy. How do you manage risk with friends? This was another central question, and it was here that having four NOLS instructors and a career raft guide felt great. We had thorough and efficient scouts; well-placed throw bags on the shoreline; clear communication about the plan and how to execute it. It is a testament to the quality of this work that nobody swam [fell in the river unintentionally], no rafts got yard-saled, and that all the rescue gear stayed in our drybags. And how do you work together when people come with different goals? What about when some people know how to do things that others don’t? We had a rotation of duties—just like a NOLS course, and everybody chipped in. We taught each other how to tie the boats up, how to pack up the kitchen just right, how to interpret the mystery that was the boat map and food master plan. Some days we hiked. 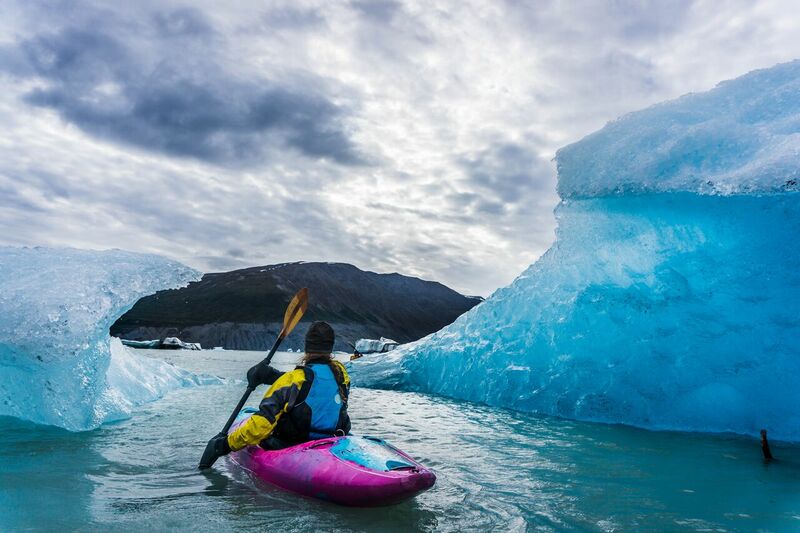 Some days we paddled hard. By the end of the twenty days we were a pretty well-oiled machine. The outfitter who picked us up was impressed that the gear was organized and that people were being nice to each other—classic NOLS baseline behaviour. So, Jane got to deepen her skill set as keeper of the vision. Ana got to thread clean lines through big powerful whitewater. Jonny got to get in the thick of things in a playboat and get comfortable at the oars. Guy kept a steady hand on the tiller. All of us return to work at NOLS with a glint in our eyes, stories to tell, big rapids under our belts, and experience helping a big group to thrive in a remote and unforgiving place. And we had a wonderful time. To journey with friends and family and to share with them the life and the way of travel that we love. To be united in experience and memory. To play. To work. To cry sometimes, too. To be awed by the beauty of that place—an ancient granary; water shooting from stone; a shifting and eternal palette of every hue of sandstone at dusk. Twenty months in the making, the stories and memories continue to flow now that our trip is a months-old memory. It will be with us for a lifetime. Thank you NOLS for your support. We can’t wait to go back! Find your wild with NOLS. Mile 110 camp—yes it was frequently sunshine and rainbows! Photo by Jane Koopman. The leader in wilderness education.